If you’ve been hanging out with me for a while on Needle ‘n Thread, you’ve probably already discovered that I have a deep love for embroidery floss of all kinds. Yes, I’m a sucker for silk, but I love cotton, too. Wool? Oh, yes! Wool is right up my alley. Linen threads? Absolutely – why not? Silk and wool blends? Oh, what a happy combination! What not to love? And that’s not to mention the sub-categories, the brands, the synthetics, the…. ok. You get the idea! I am a thread junkie! And so, this weekend, I’m going to start a little project with a new thread (new for me), and see how I like the thread and what I like about it. I can’t answer these questions without stitching something with it, after all! In the meantime, I thought I’d entice you with some photos. It’s the color, you see. I just love seeing embroidery thread in all its colorful glory, all in one place. But have no fear – the project I’m going to undertake is not composed of all these colors! So, what do we have? We have a different brand of 6-stranded embroidery floss – it’s not DMC, it’s not Anchor – from which I am going to select about four colors to stitch a project with. The colors will include black and red, because (in my opinion) they’re the colors that often pose difficulties when stitching. And once I finish with the project, or at least make enough progress on it to form an opinion, I’ll tell you a little more about the floss. In the meantime, do you use a 6-stranded cotton embroidery floss, other than DMC or Anchor? If so, what kind, and why do you use it? If not, why not? I’d love some reader input on the subject! Feel free to leave a comment and talk floss! I prefer the colors of Anchor cotton floss but DMC is easier to get, so I mostly use DMC, but recently a friend sent me some Sullivan’s floss to try. I think Sullivan’s is an Australian company. Their floss uses the same color numbering system as DMC so that their floss #whatever is the same shade as DMC’s #whatever. Their floss is a bit different than DMC’s. I think the twist of an individual ply is a bit tighter so it seems a bit lighter in weight. But otherwise it is pretty much like DMC in my opinion. I think Anchor is superior to DMC for its variety of colors. I know Marc (last name I forget) who does the flower designs for THE SILVER LINING, almost always uses anchor as well as dmc to achieve the hues he wants. One can access Anchor thread through several websites, especially stitching bits and bots and also 1-2-3 Stitch. I am so with you on color. The first time I walked into my LNS — Fireside Stitchery, my first thought was “oooo, look at the colors” — they have the fibers all hung up on pegs on the walls. In fact, still when I walk in I pause just to kind of “drink in” the colors. I don’t use a lot of cotton floss becuase most of my work is historically based (pre-1600) and I lean heavily on silk, wool, metal and some linen. I do use cotton for some things, though, especially those that will be washed. Haven’t used other than DMC, Anchor and some old “store brand” ones. Floss – a more grown up version of lusting after the 64-color box of crayons! Of course, today it’s the 120-color box. I have a lot of both DMC and Anchor, more DMC though. And a few bits of whatever was left from kits I’ve done. As Jane said, DMC is easier to get – correction WAS easier to get. Familiar story – W**mart vs local needlework shop and which one you have easier access to. Sullivan’s – isn’t that the brand that Hancock Fabrics (or is it Joann Fabrics) is starting to carry? One of them is carrying a new-to-me brand, possibly phasing out DMC. It’s early, and I’m working on my first coffee, so I could have that totally wrong. Iam curious…which one is this? No DMC here in India..so only anchor. There’s another brand called Dori,but I’ve never tried it. Its manufactured for the local market by Anchor. So I guess it wouldn’t be so different from the original. I’ve used Presencia Finca floss from Spain and Cosmo floss from Japan. Both of them are nice flosses and have great colors. In your writngs about floss you did not mention Rayon (except collectivily synthetics) and so I wondered how you feel about this floss. Will you mention it when you discuss the synthetics? DMC is my favorite thread : better quality, lot of colors. I also use House of Embroidery threads because of the subtle color variations. But in my opinion, quality of the cotton thread is poorer than DMC. I have been using Vikki Clayton’s Hand-Dyed Fibers floss exclusively now for the past 3 years (http://www.hand-dyedfibers.com). This is a hight quality silk floss, in all the DMC colors plus many of her own design. She has a very large range of variegated colors, and she is very willing to dye to your requests, if there is enough orders that would be the equivalent of one hank of silk. Her customer service is superb. I highly recommend her floss. Hi, I’m using Cosmo (? ), which I receive in a BOM that I have been working on. It’s pretty nice, and feels a bit smoother than DMC. I also found some Sullivan’s which I also likes. From another store, I have just tried the floss that starts with a “V”, (sorry, my projects are out in the car). At this time, everything seems a bit nicer to work with than DMC. Matte yarn makes such a difference if you are hooked on an ethnic style. Although I appreciate the smoothness of DMC and Anchor threads, I love the slightly rural look of Blomstergarn from Denmark, especially for vintage/traditional patterns. My favourite yarn is Zephir wool which is extinct most everywhere (exept in my drawer). Crewel yarn cannot cope with its quality. I even prefer what I get if I untwist sock wool and use it split up as a 2- or 3-ply thread. I have been using Cosmo floss recently. We started carrying it at the shop I work at and several designers (Bunny Hill, Crabapple Hill) have been listing the color numbers in their newest patterns. It feels very silky and the colors are beautiful–especially the Seasons line. I find that it doesn’t tangle as much as DMC and seems to pull through my fabrics a bit smoother. I have got the silk thread at kansas, the place referred by you and that silk thread was wonderful. I work in a cross stitch shop so DMC and Anchor are readily available along with Crescent Colors, Weeks Dye Works and Sampler Theads so that is what I mostly use. I have used unknown fibers in the past and have always been disappointed. Right now I am doing some pillowcase dolls for Christmas and the floss in the kits says that it’s DMC and they colors are correct for the numbers but the floss is very thin and skimpy and doesn’t cover well. They must use DMC seconds for kitting. I love working with wools and pearl cottons. I tend to gravitate toward the DMC because I like the sheen of the fiber but Anchor has some beautiful colors and they do mix well together. I am always open to trying new things. I am anxious to hear how you like the new floss. Madeira. It’s excellent quality, comes in a good range of colours, and seems to be colour-fast (though a lot of my work isn’t meant to be washed, so you may want to test that yourself). What I love most about Madeira stranded cotton, though, is the plastic sleeves it comes in. It prevents tangling, keeps the thread nice and clean, and, at 10m rather than the standard 8m lengths, makes me feel like I’m getting better value for money. I want to start dyeing my own embroidery threads and I’m look for wool and silk threads that are ready to dye. Do you know of any sources for PFD wool and silk threads? I have searched online but haven’t found any sources. Thanks – your blog is a great resource. Is it Finca? I recently purchased some Finca, but it is perle coton. I needed some perle in #12 and #16 where neither DMC nor Anchor offered the finer perle. I haven’t stitched enough with it yet to offer an opinion, but I have heard only good things about it. Also trying Valdani overdyed #8 perle on this project–never used Valdani either. I normally turn to DMC when I need cotton floss. It’s inexpensive (very often available for 39¢ in the US) and very easy to find. (Michael’s, JoAnn’s, etc. all carry it in the US.) It’s good quality and very consistent. I’ve also used overdyed floss from WeeksDye Works (particularly for punch needle) and the leftovers of whatever has come in various kits, but when I have to buy plain old embroidery floss, DMC is my default mostly because of its availability. why black and red colors pose difficulties when stitching? DMC used to carry a crewel embroidery yarn called Floralia, laine divisible in 5m. Is there the equivalent in Madeira or other brand? The color range for floss is fantastic. Not to mention the price, however, I prefer wool. I love Cosmo emboidery thread! When I had been embroidering a project with a black of another brand and having trouble with it, a friend introduced me to Cosmo and I have bought nothing else since. 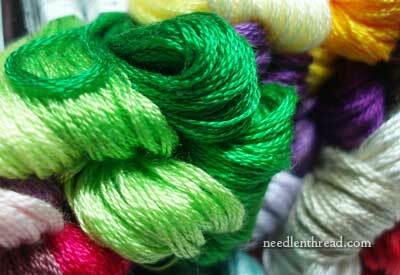 I just purchased a few skeins of Cosmos 6-strand cotton floss. It was more expensive than DMC. I used it today, but I’m not sure I notice enough of a difference between the Cosmos and DMC to warrant the difference in price. The Cosmos is from Japan and cost over $1.00 per skein. I can’t find the receipt to tell you the exact cost, but I do recall it was more than $1 per skein. Has anyone else used this floss? I tend to use Anchor because someone told me it is colorfast and DMC is not? As far as the stitching goes I don’t notice too much difference between the two. I’m curious about bamboo thread – have you used it? I love bright colors for embroidery,having made this comment to a friend she ragaled me with a package of a “Design for the Needle” cotton floss made in Mexico. The colors are gorgeous. Do not know how to post a pix here for all to see. Making Holiday ornaments for gifts, I had a lot of trouble with the red DMC, it kept shreding, so I changed to wool. Like you and many of your readers I adore the colours of floss. I mostly use DMC, but have also used some Sampler Threads and, more recently, Threadworx, both of which are variegated. I particularly like the vibrancy of Threadworx and the great colour combinations. I find that it works well but, as I said a couple of days ago, it is not colourfast. Are using black and red colors because they are the ones most likely to bleed when washing? I like to use “rayons” especially at Christmas. Brings out the colors and festive mood. I also use Brazilian Rayon threads. And, then there are the metalics. I too am a silk nut but I love using the Overdyed threads like GAST Weeks etc. Crescent Colors have been showing up in my stash alot lately also. I am with threads like a quilter with fat quarters. Besides DMC I like Presencia from Spain. They have some soft muted colors that I sometimes like to use. Another one with a lot of fun overdyes is Thread worx; and then there is Gentle Arts for yet a different collection of colors. They are all different – we need to collect the all. I am a thread-a-holic too. I use Madeira, as the local shop has it and a great range of colours, also use Threadworxs, lovely range of colours as well. I enjoy my stitching, love playing and having all those colours around. Hi, All – thanks for your comments on this post! It’s interesting to hear what floss people prefer working with, isn’t it? For the red and the black question: black is always a bit different from the other colors in almost any kind of floss, it seems. This has to do with the dye. I can always tell a difference when stitching with DMC threads, between black and their other colors. As for the red, yes, it’s a question of color run. If any thread color will run, it’s usually the reds. I use which every thread can give me the colour and texture that I am looking for in my work’ what every the brand. But for stranded cotton I find DMC has the best colour range and Threadworx is a pleasure to work with because it is made from Egyptian cotton and the staple is long, giving it a silky feel and it sits well. My choice of threads used to be limited to what I could buy in my local shops. Now with the internet I have every on-line shop in the world. Not too good on the budget though. Whoops, a little late to this thread, but great to read everyone’s preferences. In the main I have a collection of Anchor and DMC, and prefer Anchor, probably because as young as 8-10 years of age that is what my Embroidery Teacher gave us to use! I really love Presencia Finca thread, which I buy from there agent in the U.K. and she is really quick to post my orders to me. Madeira from time to time, I only have a small supply ( need to get to a store when next in the U.K. and look at the colour range). My absolute favourite to work with however, is Anchor Marlitt. I guess that hasn’t been mentioned to much as it is 4 strands! As I work a lot with silk dupion for my smocking items, I really love the sheen of this thread. I would really love some guidance on purchasing pure silk embroidery threads and loved your recent blog about Pearsalls threads, so must look into that……………I think I would like to work a lot more with silk threads. Thanks for the daily “chats” that arrive in my inbox and make my day! Hi i usually use Anchor and Dmc but now that i am in mexico Iris is the thread that is most available but i have trouble because my patterns call for dmc and i can not find a conversion chart on line. Does anyone know a site that has a DMC or Anchor to Iris ? Thanks. Was at Hancocks in S. Cal last week, looking for a project for Christmas. They did not have DMC thread, it was Sullivan thread. Claims to be stronger than DMC..As soon as I finish unpacking from my move will get started on the project. Has anyone else heard of and used Sullivan thread? Il y a une dame qui reside a Berlin, Kathie, il est possible qu’elle puisse vous donner des conseils sur des achats de laine crewel. Franchement, les couleurs et la laine de renaissance sont magnifiques. Donnez moi le nom du site en Australie–peut etre que je puisse regarder..voir les prix, conditions, etc et vous en faire part. Now I know about Black and Red colors. It may be why the cochineal dyed yarn fouled up..or maybe it is the revenge of the bugs. They are located in France. Also, Au Ver a Soie produces a wool thread for crewel work called “D’Aubusson”. Kitty – I haven’t been able to find a conversion chart for DMC to Iris. Maybe if you contact directly the company that produces the thread, they’ll be able to help you. Linda – Yes, Sullivan’s is a 6-stranded cotton floss. The original company is in Australia, but they have a US subsidiary here. I believe they have a “contract” with Hancock’s to supply their embroidery thread. I’ve seen it but haven’t tried it. I stitched a phone sleeve with this thread and I quite like it. You just have to be careful not to let the thread get untwisted! I see I am late responding. If any one is still reading there has been a lot of discussion in my stitching group about Sullivan vs DMC. Many complaints about Sullivan. Just hold a skein of white DMC in you hand along with a skein of Sullivan white. Since Michael’s is our local source we keep hoping they stay with DMC. If this line is still alive, a group of us were wondering who makes the unnamed floss that comes in kits? You know, when you are supplied with one stand of one color and three of another etc. Now that the question has come up we feel the urgent need to know. I’m new at smocking and have been useing DMC floss.and floche floss I was woundering what is the best floss I herd of presencia being bleach safe? DMC likes to get fuzzyon me.Would like to know what is the best for picture and geomtrical smocking? And would like a little shean not as much as a rayon thread. Please Hepl I’ve been surching the web for daysnow and so far your web sight is the best. Hi, Amy! I’d try silk, personally – it always look great smocked. But you’ll have to use short lengths – no longer than 16″ – 18″. Stranded spun silk is very nice – it has a beautiful sheen and is easy to work with. My favorite brand is Soie d’Alger by Au Ver a Soie. You can find it in fine needlework shops or through online shops like Hedgehog Handworks. If you want to stick with cotton, why not try floche? It’s a beautiful thread, but it isn’t divisible, so instead of pulling several strands from the main thread, you use just the one strand of floche (or you can double it, if you want something heavier). You can also find DMC floche at Hedgehog Handworks and also through Lacis, both online. Is floche comparable to edmar? or other brazilian dimensional embroidery focused products? I have really only used DMC cotton 6-stranded and DMC Perle threads for years and years. 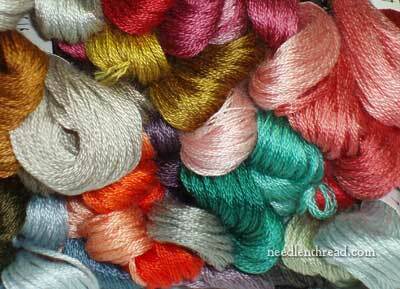 Recently I bought some some quality silk, linen, silk/cotton blend and rayon threads from my local shop. 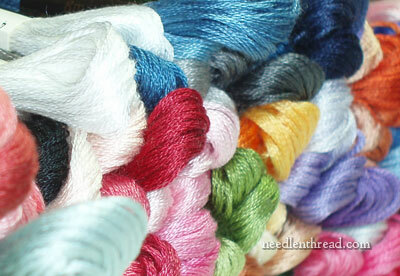 I also ordered (online) some very inexpensive silk thread from overseas (from India through England). This difference is HUGE!! I will probably use the cheap silks (I do mean CHEAP, price and quality) to make some tassels or something. But will be mindful of buying quality embroidery supplies. I learned my lesson!! I decided to take up cross stitch between sending out resumes and waiting for the phone to ring. I found that stitching is a life saver! But the real silver lining in my cloud is finding a new brand of floss to use. The floss isby a company called Sullivans. Not only am I saving money, but I have found that I am not wasting thread. I am a redit type person. If I don’t like my design one way, I take it out and restitch the design. I found that their threads did not bleed, did not fray/split or leave pieces behind in the cloth. I was able to reuse the same piece of floss without a hint of distortion in the thread. I guess unemployment did come with it’s advantages. Anyone looking for Help? I’ll send you a resume! I wish I could send you a photo. I made a sampler (Like the stitchery women in the 1500s made) and it was so I could practice my stitching and create designs before I started a costly project. The entire AIDA cloth is covered with stitches unlike the modern samplers you see. The sampler has turned out so beautiful, I have been offered, and probably will accept over $200. What I have learned and tell to my students is no matter how something looks, do not stop but continue to the finish. You will be surprised at the final product. Most art is 75% accident. My sampler, now tapestry, had several areas where I even put it down for a WEEK because I wasn’t enjoying it; I didn’t like the effect. But I found as I continued, it became more and more exciting, because the results were so unexpected. Of course if you are following a chart, and it isn’t as it should be then yes you may want to take it out. I know this from almost 4 years ago, but I just now have gotten back into embroidery and wonder why I hadn’t started again for so long. I used to embroider Blue jean jackets in the 70s os mostly album covers. My best was Mountain, The witch. I would charge $50 which would be $300 today. And then I stopped. So I am greatful for the outlet and the camaraderie. I have a couple of different floss colors that are not DMC – the kind I use regularly. I would love to what these floss numbers would be in DMC but am unable to find a conversion table – here is what I have. If you could help out with this, I would appreciate it. Question: in the study of antique samplers and other embroidered materials, which floss retains its colors longer, cotton or silk? I was wondering if anyone knows of a store or website that sells DMC or Anchor and that would ship to Mexico? The Iris floss is cute but it’s not practical as they don’t have a conversion chart. And I’ve asked the company (3 months ago) and I still didn’t get a reply. I don’t want to have to make a trip to the states just to get floss. Can anyone help? Thank you. Much appreciated! I know this was 2 years ago, but have you tried ebay? I’ve used DMC for years, but recently I began using Cosmos floss. I find that it doesn’t tangle and has great colors, especially the variegated. The cotton fibers seem to be smoother and I can use a longer piece to stitch with. Where did you purchase your Cosmo thread at? I make tapestries with an array of products. I hate anything other than silk rayon )Oasis) or metallic sheen(oasis or KUM), but I still use the regular stuff from time to time. This I found a beautiful thread with a lustrous sheen on EBAY for $9 for 200. Of course that price changes from time to time, but truly it is a beautiful thread. Unfortunately, it has a generic label. I love and hate my Edmar investment I just made. I find that the more I pay for the thread, the harder it is to manage. I have used both thread heaven and bees wax to no avail. If you want to see even the most docile personality go John Wayne Gacy on you, try having them unravel a skein of EDMAR glory. Recently received a wool applique kit with Chinese floss. I compared to DMC and Coats. No luster at all and colors were off. It was called Sullivan’s. I don’t feel confident about using this on a quality project. Please inform stitchers on floss qualities, etc. Thank you! Yes, I’m not a huge fan of Sullivan’s. I’m not sure if it is made in China, though. They say it’s long-staple Egyptian cotton like DMC, but the one time I tried it, it felt very “dry.” But it could be, perhaps, different from the Sullivan’s sold in some stores in place of DMC. I don’t know. Sullivan’s has a website, though, so you might be able to see where there floss is made to see if it’s the same stuff. Hi! I live in Russia and we have some local floss companies. One of them has been working since Soviet times, it has a lot of shades, but the quality is different, it’s not bad, but threads do not shine at all. The other is a modern company, it is called Gamma, it has more than 600 shades of threads, and the quality is pretty much similar with Dmc, I use them to complement my Dmc and Anchor palettes because there are plenty of colors and hues which are not presented in them. So I can get more shades in my collection! By the way Russian floss is much cheaper, like 3-7 times cheaper, it depends on each shop price politicy. So pensioners use mostly Russian threads. Younger embroiderers prefere Dmc.